Today a consensus amongst scientists is growing that mankind, through the emissions of greenhouse gases (section 1.2.1), is enhancing the Earth’s natural greenhouse effect (section 1.2.4). Before investigating the evidence for anthropogenic climate change and global warming, it is useful to review the nature of the Earth’s greenhouse effect. Solar energy in the form of visible and ultraviolet radiation is partially absorbed by the atmosphere (25%) and Earth’s surface (45%), and partially reflected by the atmosphere (25%) and Earth’s surface (5%) (Figure 1.3). Energy absorbed at the Earth’s surface is re-radiated back to the atmosphere as infrared radiation, longer in wavelength and lower in intensity, since the Earth is much cooler than the Sun (section 1.2.3). 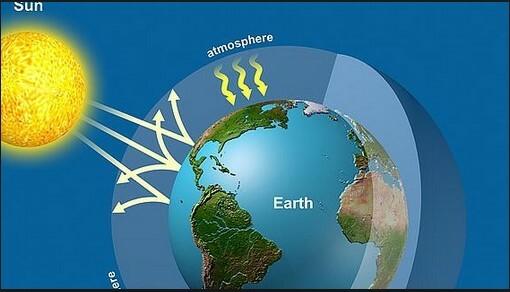 Certain gases in the atmosphere are transparent to the incoming short-wave solar radiation but trap (absorb) the outgoing long-wave terrestrial radiation. This increases the kinetic energy of the gas molecules causing the temperature of the atmosphere, and subsequently the Earth’s surface, to rise. Most absorption of infrared radiation takes place in the lower atmosphere, the troposphere (section 1.2.2). This warming phenomenon (33C) is known as the natural greenhouse effect since the atmosphere is acting like the glass in a greenhouse, allowing short-wave radiation through but trapping much of the long-wave radiation trying to escape. The absorbing gases are called greenhouse gases. 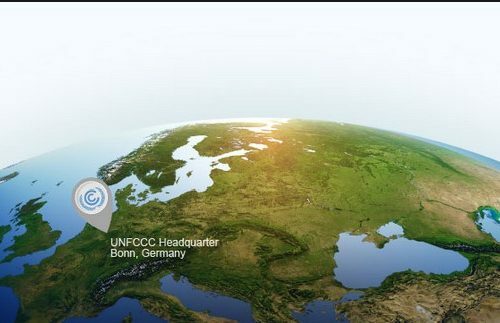 Natural greenhouse gases include water vapour, carbon dioxide, methane, nitrous oxide and ozone. A more detailed narrative of the greenhouse effect may be found in section 1.2.